There is a famous Jimmy Buffet song: Cheeseburger in Paradise. One of the lines says: Heaven on Earth with an Onion Slice. I am living my own version of Cheeseburger in Paradise, except I fancy cheese pizza instead of a burger. I was sitting on the deck of the house last night enjoying a slice of cheese pizza and looked out among the trees and into the valley/meadow/swap area behind the house. 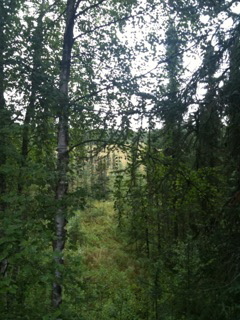 That is the area that leads to the trails that encircle us to the north. There was a light mist in the air and I contemplated all that it took to get me to this moment. The years of running dogs in 1990’s, the move to Denver to follow Michele’s career that she hated and later quit to join me at Denver Dog Works, the thousands of dogs that we have trained at our training school, the raising of our kids right so they understand business ethic and family values and what it means to work for what you need and you don’t always get what you want. And then I thought about the lyric again: Heaven on Earth with an Onion Slice and it made me think; that even with all of this it is still bittersweet (kinda like a red onion). I miss my family terribly. I know some of that will pass as I work my way through this year before Michele and the kids move up after the school year but I value my family more than anything in this world. They are my slice of heaven. Yesterday I drove into Wasilla to pick up some things and buy a pair of Carhart overalls because I am ruining all of my pants (all six pair of them) in all of this muck and gunk. I have never owned a pair of overalls in my life and I can’t help but think they make me look like one of my favorite DIY’ers on TV, Mike Holmes on the show Holmes on Homes. If I only had his skill and craftsmanship! As I drove down the Parks Highway toward town there is a spot that overlooks the valley and you can see the mountains in the distance and the low hanging clouds that make it look like you are on top of the world and I thought; this is what draws people here. This serene beauty and un-abashed wilderness that surrounds us. Today I am taking the day off and heading to one of the local campgrounds and see if I can find a hiking trail to wander on for a bit. I love hiking. It clears the mind and rejuvenates the soul. I want to see what the trails have to offer here only sixty five miles from a major metropolitan area (Anchorage). It will be a nice day and maybe Ill stop off and have a cheeseburger too!